CMT continues to add partner colleges to its CMT Empowering Education initiative with the addition of 15 schools across rural America, including the participating schools of the Missouri Community College Association. The program aims to increase the number of residents with postsecondary credentials including degrees and certificates in economically-depressed communities. 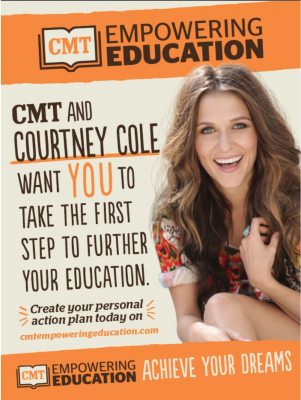 For the first time, CMT Empowering Education will expand into Arizona, Arkansas, Florida, Iowa, Michigan, Missouri, Nebraska, Oregon and Texas, bringing the total reach of the program to 25 colleges across 17 states. CMT first announced the community college initiative in 2014 at the Clinton Global Initiative-America meeting. Working in collaboration with the American Association of Community Colleges (AACC), CMT Empowering Education experienced early success as the 10 pilot partner schools hosted local events, bringing star-power and helping to put a face on education by highlighting success stories of students. Prospective students learned about solutions to some of the biggest obstacles they face, including financial aid and part-time programs. Hazard Community & Technical College (HCTC) in Hazard, Kentucky was the first to host such an event and spotlighted coal miners who returned to school and found success re-training for different careers. Since HCTC held its CMT Empowering Education event in 2014, the school has added additional programs to accommodate increased demand.